The annual BC Hunting, Fishing and Sportsman show on March 3,4,5 is just around the corner and we’re taking a little bit of the Cariboo to the show. 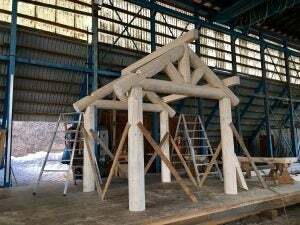 Known as the Handcrafted Log Home Capital of North America we thought what better way to represent the 100 Mile House and the South Cariboo than from a Log Built trade show booth. We partnered with Sitka Log Homes to design and build this unique display and are excited to feature all the spectacular properties we market from it. If you’re going to be at the show make sure you pop by and say hello or if you have a property in the South Cariboo that you would like us to feature give us a call.